A World Cup finalist, two young Dutch internationals, two double-winning Serie A champions and Italy internationals, an American international with 27 goals to his name last season and Eredivisie’s top goal scorer with a total of 31 league goals last campaign. All of those are big claims, big achievements, big accomplishments that are akin to players that play for big clubs, you might think. You’d be wrong. All of these stats and facts are credited to players who have joined, or are close to joining, mid-table Premiership clubs. There’s been a number of quality players that have came to England from across Europe this summer and, so far, most of them haven’t been going to the top clubs in the league. 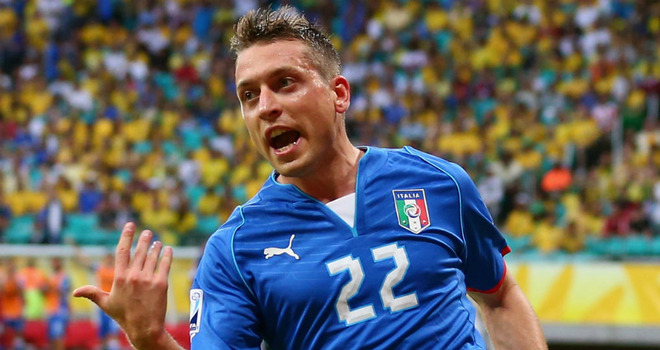 The likes of Juventus winger Emanuele Giaccherini who starred for Italy at the Confederations Cup last month is edging closer to a £10 million move from Turin to Wearside. Victor Wanyama, who was previously linked with Manchester United and Liverpool, made the move from Celtic to Southampton recently for a fee of £12.5 million. Wilfred Bony, who after topping the goalscoring charts in Holland joined Swansea in a £12 million move. Maarten Stekelenburg who kept goal for Holland in the 2010 World Cup final has joined Fulham for a £4 million fee from Roma… The list goes on. Okay, the likes of Dejan Lovren didn’t quite turn down Barcelona before joining Southampton but they are quality players nevertheless. Ricky van Wolfswinkel is replacing Grant Holt in Norwich’s frontline, Modibo Diakite joins Sunderland as Titus Bramble leaves the club and Andy Carroll replaces Carlton Cole at Upton Park. That is the level of improvement going on at mid-table clubs this summer; it shows a massive step up in quality. Southampton reportedly had a £17 million offer for Roma’s Pablo Osvaldo rejected before the Italian striker turned down the opportunity to move to St. Mary’s while Sevilla also knocked back a £14.5 million bid from West Ham for Alvaro Negredo. To even make bids for those players and offer that type of money shows massive ambition for clubs that finished 10th and 14th in the league last season. A total of seven Premier League clubs have broken their transfer record this summer – and the window has only been open for a fortnight, but how? Few of these clubs have sold any players to fund these record breaking moves. Southampton still have Luke Shaw despite Chelsea’s interest, Michu hasn’t yet left the Liberty Stadium and Dimitar Berbatov is still sitting on a healthy wage package at Fulham. So where has all this extra money come from? It’s coming from Sky Sports, BT Sport, Fox Sports, NBC, TSN and many others… The Premier League recently announced a £5.5 billion TV deal beginning this season, which is £2 billion more than the current deal. Half of that money will be split up evenly between the twenty Premier League clubs season by season, 25 percent is awarded to clubs based on where they finish in the league and the final 25% is paid in ‘facility fees’ calculated by the number of times clubs have their fixtures are shown live on UK TV during the course of the season. So, to put the financial benefits of the new deal into perspective, last season Manchester United, as the league champions and highest TV earners, received a payment of around £60.8 million in TV money. QPR, as the bottom club and lowest earners, received a payment of approximately £39.7 million in TV payments. Next season the club finishing bottom in England’s top division will receive approximately £60 million, similar to what Manchester United earner last season as league champions. The Premier League champions for the upcoming season, whoever that may be, will earn close to £100 million in TV revenue. That extra finance won’t make a massive difference to the very top teams in the Premier League like Chelsea, Manchester City and Manchester United who have always had plenty of money to spend when the transfer window opened every year. While it may be a factor in Arsenal seemingly deciding to splash out a bit this summer I think a bigger factor in that would have been Tottenham pushing them more and more each season for them Champions League qualification. The rumours may also be an attempt to convince their fans, who may be struggling to justify paying £1,200 for a season ticket again, to stick around for a little while longer. For the mid-table Premier League teams however, it will make a big difference. While Swansea, Southampton, Norwich and the like can’t compete with Barcelona, Real Madrid, Juventus and Bayern Munich they can now compete with the likes of Atletico Madrid, Valencia, Fiorentina and Bayer Leverkusen – at least on a financial level. The mid-table Premier League clubs can afford to spend an extra five or ten million on a player if they want to. They don’t have to settle for the hot property in the championship on low wages and a relatively low transfer fee. Tom Ince is the perfect example of this, despite having a brilliant season for Blackpool last season the only concrete Premier League interest in him is from Cardiff who themselves are only a newly promoted side. Maybe last season Sunderland would have considered him, but this season with that additional TV money, they can afford to pay extra for someone like Giaccherini. An older player but proven on both the international stage and at one of Europe’s elite clubs, something that can’t be said about Ince. The biggest point’s gap between two positions in the Premier League last season could be found between Liverpool in 7th and West Brom in 8th with 12 points separating them – that number will only decrease next season as the mid-table clubs improve with more quality signings from Europe like Giaccherini and Bony. While even more riches in the Premier League may not bode well for young English players like Ince and therefore the future of England’s national team as a whole it will go a long way to ensuring the Premier League continues to be the best, or at least one of the best, leagues in Europe.